Car Pretty LLC - 2 Color TRD - Off Road, Racing Development. 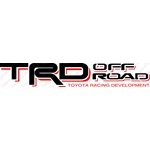 2 Color TRD - Off Road, Racing Development. TRG Off Road decals available in 2 colors that you choose. 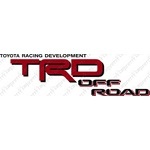 These Toyota Racing Development Off Road stickers are made in 3", 4" or 5" premium vinyl.